Scripts for Applescript, ASP, JS, a.o. A while ago, I was looking for a way to shrink my list of mailboxes and the 1000s of mails therein. I have used MailSteward Pro to backup my emails to a remote MySQL server for a long time, in case everything gets lost at Apple's iCloud. Which isn't very likely, so I started looking for another way to archive old emails and still have the same easy access with all search capabilities. This where Evernote comes in! With Evernote I can search on anything, even text in PDFs and images. Googling a bit I found this AppleScript: Apple Mail to Evernote. The script works nearly perfect and I added and changed some code to get the date/time in the title of the note and some other things, see the version history below. Follow my blog-posts for any updates on this script. Note : for some obscure reason I have not found yet, the compiled script sometimes do not extract the message(s). In that case, use the uncompiled script. 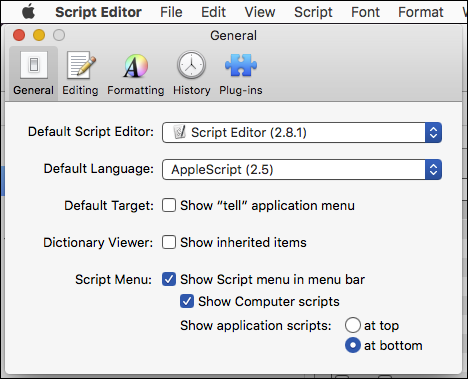 and simply move the app-version into this folder and you will see the script listed under the AppleScript Menu. 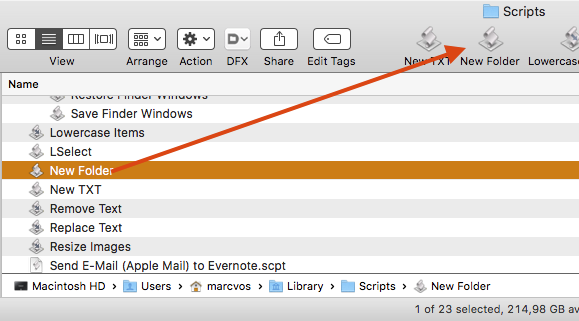 Go into Apple Mail, select one or more emails and choose the 'Send E-Mail to Evernote'-script from the AppleScript menu. Check the chosen Evernote notebook if your selected emails are in there, and if so, you can delete the original messages. Note : Some encoded message-content seems impossible to convert, and the script would crash. What I did is that the note in Evernote is created, with the nice header and all attachments, but with the encoded message text. What you then have to do is to go into Apple Mail or Microsoft Outlook and copy the email text, go back to Evernote and delete the encoded text and then paste the message text into the note. Thanks to Veritrope for the basis of this very useful script! v2.08 05-2014 Added date and time in front of the subject-title so when sorted alphabetically in Evernote, the emails are listed by date/time. v2.09 07-2014 Fixed HTML parse bug in htmlFix where the check on ; chrashed the script when there was or equiv. in the string. v2.1 07-2014 Fixed time display in the note's title when adding multiple emails. All but the last note's time in the title would be converted to, for example 14:05, 1=4=0=5. Look for replace_chars. v2.2 08-2014 Added a dialog at the end so you know when the process has finished. v2.3 08-2014 Encountered an email without a content-type header. In that case I set myHeaders to 'text/plain'. v2.4 01-2019 Added code to remove from HTML e-mails, because this often breaks the import into Evernote. If you do not want this, comment the 'removeBetween' function call. v2.5 02-2019 Removed Growl support and modal dialog messages, and replaced those with standard mac OS Notifications. This script saves the current open windows, their positions and sizes, including the tabs inside these windows ... into a text file! This text file can be edited and modified in Sublime or TextWrangler. You can also sync it to another Mac! Lines that start with a $-sign are Finder Windows coordinates, separated by $-signs. 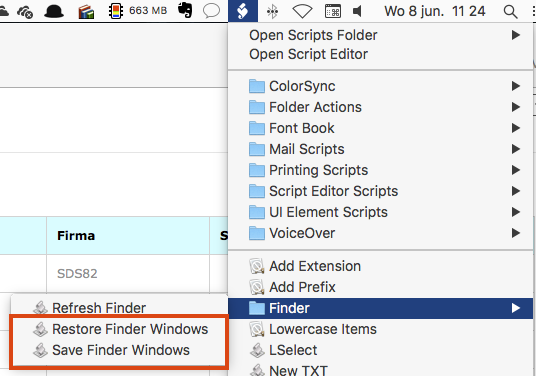 Lines that follow a Finder Window definition, are paths that are made into tabs inside that Finder Window. You see that you can modify this TXT-file yourself and add or remove windows and paths (tabs). This script reads the text file, creates the windows at their saved positions with their saved sizes and reopens, inside these windows, the saved paths as tabs. Of course you can execute scripts at any moment you like. The text file will be overwritten, with each execution of the 'Save Finder Windows'-script. The ZIP contains the editable scripts and the compiled versions. 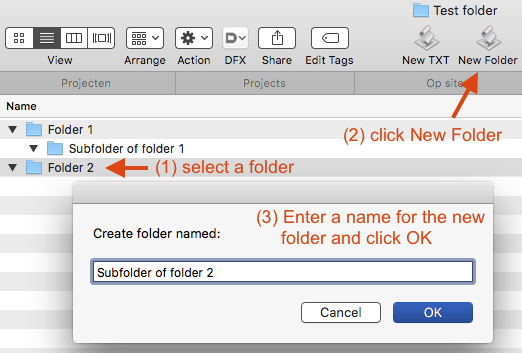 Here's an AppleScript with which one can create a new folder inside a current or selected folder, or inside a current window or inside a folder containing a selected item. -- display dialog "Nothing happened"
and set, consisting of a login script and a user-maintenance script, which uses a generated hash table to check against entered username/password, on the client's computer - no check on a server involved. The download contains a Subversion StartupItem for OS X that will start svnserve with option -d so it runs as a standalone deamon. Just unzip and double-click the package file. Here's an AppleScript to start the TN5250j Terminal Emulator with multiple sessions in one window. You can add this icon to the dock between your other applications. Here you can download some handy AppleScripts for Trans-Tex' Tex Edit Plus. Mac -> PreHTML : Inserts the page structure and surrunds the original content with <pre></pre>. Mac -> ISO-set : Translates some special characters to HTML entities. Make <SELECT> pop-up menu : creates a pop-menu wth an onChange event from the original content. My learning project for Active Server Pages : a webpage to register the kilometers you drive for private or business use and the costs for your car(s). You can register an unlimited number of cars. An empty Access-database is included.